The Mini PT-600 is designed to perform the 60 Hz power line cross test/AC power fault tests required in GR 1089 issue 6 table 4.5 surge test 3,4, 4.3,and 6, and for UL 1950 section 6.4 paragraph 3 and 4.. Preset and Adjustable Time Settings Measuring Terminals including Voltage Sense and Current Shunt portals provide a safe location for users to accurately measure test voltages and output current while setting up tests. 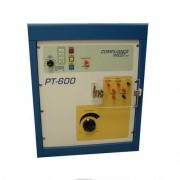 Calibration of the Mini_PT-600 is designed to be performed with a simple handheld multi-meter and the removable Currents Shunts can be easily sent to a calibration laboratory if required. Computer controlled operation is available with the TestMinder PT option. input power requirement: 208 @ 50-60 Hz, 25 A. 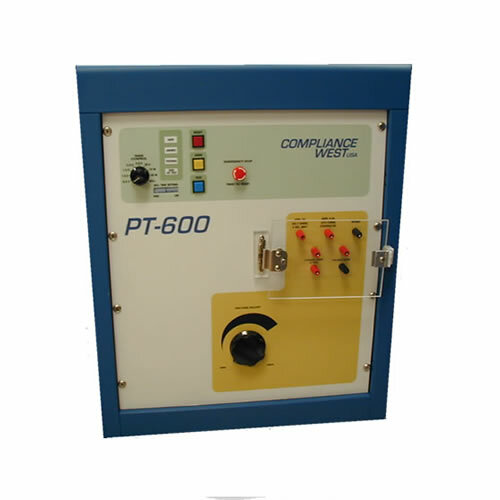 The PT-600 can conduct power cross tests specified by UL 1950/60950 and Bellcore/Telcordia GR1089, as well as the High Impedance Inductive Source Test specified in GR-1089. Some options may be required. Areas of use are (1) Line Cross Power Test (2) First Level AC Fault Test, (3) 600Vac 2 ohm Test per GR1089 Second Ed., Clause 4.5.11, (4) High-Impedance Inductive Source Test, and (5) ITU-T Power Induction and Earth Potential Rise (with correct options). Equipped with an E-Stop button on the front panel, and external interlock terminal, for user safety. All outputs are covered by an interlocked door to avoid operator contact with live outputs. Optional fuse monitoring can speed testing. Outputs can include up to 600V, 10 Ohm impedance (60A), by two channels for 5 seconds max. and 600V 2 ohms (with line simulator fuse). Continuously variable 0-600V, 90-13.6Kohm continuous duty outputs for setting output just under the protection limit. TestMinder PT is standard and allows automatic test management for multiple tests at same output. Tests can also be conducted from the front panel of the PT-600. Adjustable time settings are available for programming from the front panel for special test durations. Custom outputs and configurations are available. Contact factory.